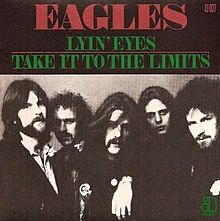 European picture sleeve, mistitling "Take It To the Limit" as "Take It To the Limits"
(1975) "New Kid in Town"
The song was written by Eagles' members Randy Meisner, Don Henley and Glenn Frey. Meisner, who sang lead on it, says the song began as his solo composition. As it remained unfinished when time came for the One of These Nights album to be recorded, Henley and Frey assisted Meisner in completing it. Meisner's performance of the song was popular with the audience in Eagles' concerts, but disputes over his reluctance to perform it would also directly lead to Meisner's departure from the band. According to Meisner, he wrote the first few lines of the song one night while playing an acoustic guitar after returning from the Troubadour; however he was not able to finish the song by the time they were close to recording it, and Frey and Henley then helped him with the lyrics. Meisner later said of how he would usually write songs with the Eagles: "I'd get a verse or two, and I'm done, and they would help fill in the blanks"
On the meaning of the song, Meisner said in the documentary History of the Eagles: "The line 'take it to the limit' was to keep trying before you reach a point in your life where you feel you've done everything and seen everything, sort of feeling, you know, part of getting old. And just to take it to the limit one more time, like every day just keep, you know, punching away at it ... That was the line, and from there the song took a different course." Meisner sings lead on "Take it to the Limit" and the song was released as the third single from the album One of These Nights. It is the first and only Eagles single where Meisner sings lead. A live performance by Meisner from 1976, recorded at The Forum, Inglewood, California, is included in the album Eagles Live, which was released in 1980 after the band had effectively broken up. The song was rerecorded on Meisner's first solo album (Randy Meisner) released in 1978. The song was performed with piano and acoustic guitar accompaniment, and 1970s teen idol David Cassidy singing in the backing vocals. Eagles - "Take It to the Limit"
The climax of the song as performed by Randy Meisner in a concert in 1976 (from Eagles Live). Meisner was concerned about not hitting the high notes, and his reluctance to sing the song led to disputes and eventually his departure from the band. According to Frey, fans of the band loved Meisner's performance of his signature song "Take It to the Limit" at concert. As Henley puts it: "They went crazy when Randy hit those high notes". Meisner, however, was concerned about not being able to hit the high notes, but Frey was insistent that Meisner should perform the song in concert for the fans, and live performances of the song then became a source of great contention between Frey and Meisner, and would eventually become one reason for Meisner leaving the band. Meisner had been struggling to hit the crucial high notes in the song during the Hotel California tour. According to Joe Walsh, Meisner could perform the song, but would become nervous when told he had to sing it. By the time they had reached Knoxville, Tennessee in June 1977, the band was feeling the strain of a long tour, with Meisner unhappy and suffering from a stomach ulcer. Meisner decided not to sing the song for an encore because he had been up late and caught the flu, Frey and Meisner then became involved in an angry physical confrontation backstage over Meisner's refusal to perform the song. After the altercation, Meisner was frozen out from the band and he decided to leave. He left the band at the end of their tour in September 1977 and was replaced by Timothy B. Schmit, coincidentally the same bassist who had replaced him in Poco. The song was revived for the Eagles' late 1999 shows at Los Angeles' Staples Center and at those shows, as well as the Eagles' Farewell 1 Tour in 2004 and 2005 and on subsequent tours, the song was sung by Frey. Originally in B major, the song was transposed down to G major to accommodate for Frey's vocal range. For the band's 2017 shows, lead vocals were taken by Vince Gill and was again transposed to A major. (1983) "Take It to the Limit"
The song was covered by country musicians Willie Nelson and Waylon Jennings as the title track of their duet album, Take It to the Limit, which was released in 1983. Dave Mason covered this song. The song was covered by Jill Lancaster for the 1977 Christo documentary Running Fence. The song was covered in 1977 by Etta James for her album Deep in the Night. Cher performed the song on her first solo tour in 1979–1980 and again in 1989–1990 on the Heart of Stone Tour. In 1993, Suzy Bogguss recorded the song for the album Common Thread: The Songs of the Eagles. Sarah Dougher covered it on her 1999 album Day One. Richard Marx would regularly cover this song in concert. One 1987 performance, which was filmed, included both Meisner and Timothy B. Schmit, marking the only time (outside of the Eagles' induction into the Rock and Roll Hall of Fame) the two former Eagles and Poco bassists shared a stage. Meisner played 12-string acoustic guitar and Schmit sang backing vocals. ^ Harvey Kubernik, Scott Calamar (October 7, 2009). Canyon of Dreams: The Magic and the Music of Laurel Canyon. Sterling. p. 281. ISBN 978-1-4027-6589-6. ^ History of the Eagles. 2013. Event occurs at 50:55–51:57. ^ History of the Eagles. 2013. Event occurs at 1:12:40–1:13:40. ^ Marcus, Greil (2007). Stranded: Rock and roll for a desert island (2nd Da Capo Press ed.). New York: Da Capo Press (Perseus Books Group). p. 87. ISBN 978-0-306-80682-7. ^ "Randy Meisner – Randy Meisner". Discogs. ^ a b c History of the Eagles. 2013. Event occurs at 1:39:20–1:42:05. ^ a b Andy Greene (July 16, 2015). "Flashback: The Eagles Play 'Take It to the Limit' in 1977". Rolling Stone. ^ "Eagles – Biography". Billboard. Retrieved 2014-05-24. ^ "Top RPM Singles: Issue 4109a." RPM. Library and Archives Canada. ^ "Top RPM Adult Contemporary: Issue 4099." RPM. Library and Archives Canada. ^ "Charts.nz – Eagles – Take It to the Limit". Top 40 Singles. ^ "Top Singles – Volume 26, No. 14 & 15, January 08 1977". RPM. Library and Archives Canada. Archived from the original on June 10, 2016. Retrieved January 22, 2016. ^ "Top RPM Country Tracks: Issue 6717." RPM. Library and Archives Canada. ^ "Willie Nelson Chart History (Bubbling Under Hot 100)". Billboard. This page was last edited on 6 December 2018, at 07:24 (UTC).